What makes great ad-sales people stand out? Not looks. Not back-slapping gregariousness or smooth talk. Not “won’t take NO for an answer” drive or closing tricks. In the world of major account ad-media sales, in order to shine, the best ad sales people do five things. When they do, not only do they win more, bigger, accounts, but soon they are promoted to lead their teams. 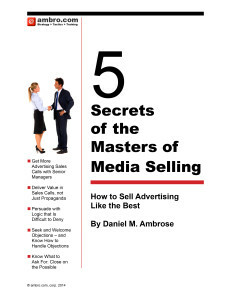 We teach these 5 secrets at ambro.com in our private customized sales training for major media companies, and skills we teach in the public Masters of Media Selling seminars co-produced with MediaPost. 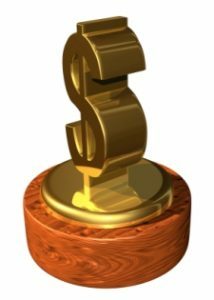 The very best ad-sales executives get MORE, HIGHER-LEVEL APPOINTMENTS. The media buying world is organized into the buyers who say they decide what to buy, and the influencers who really make the decisions. At every level, local or national, consumer or b2b, the buyers “decide” what to recommend to their bosses. Buyers recommend what they think their bosses want. So getting to the top managers is mission-critical. In order to win access to the influencers, and maintain relationships where the decisions are really made, top ad-sales people BRING VALUE TO PROSPECTIVE CUSTOMERS beyond why their property is good, efficient or otherwise desirable. Top media-sales executives deliver information, or perspective, about the prospects’ own businesses that makes senior executives and business owners, the influencers, glad they met with an ad-sales executive. Top executives don’t want to hear why your media property is better then its competitor. Influencers want to learn something about their own business from you…like new information on how their own customers make purchase decisions, or how their own market is changing. It’s logical that ad-sales persuasion should rely on logic, but too many sales people forget that logic has no traction without shared assumptions. The very best ad-sales people focus their discussion first on HELPING THEIR PROSPECTS BETTER UNDERSTAND THEIR OWN CUSTOMERS AND THEIR NEEDS. Those needs are the assumptions that allow logic to persuade their prospects. Without agreed-upon assumptions, logic has no traction. SEEKING, RATHER THAN AVOIDING, OBJECTIONS is the fourth habit that separates the best ad-sales people from the rest. Buyers and influencers too often hide their objections, giving the impression that they like what they hear. As a result there is an epidemic of “good calls” that go no-where. When objections are not known or handled, sales people are over-optimisitic about the opportunity to close the deal. It leads to missed opportunities and bad forecasting. Finally, the very best ad-sales executives know what to ask for in the closing process. The real masters ASK FOR A COMMITMENT THAT IS POSSIBLE, not a commitment that is impossible. Major account buyers simply don’t buy on the spot. So asking for the order isn’t a viable tactic. Top media-sales people ask for a next step that can be promised by their contact. And when the prospective client won’t commit to the appropriate next step, top sales people go into the objection-seeking mode. To train your team to be the very best at advertising media or sponsorship sales, engage Ambro.com or sign up for our public seminars in association with MediaPost.